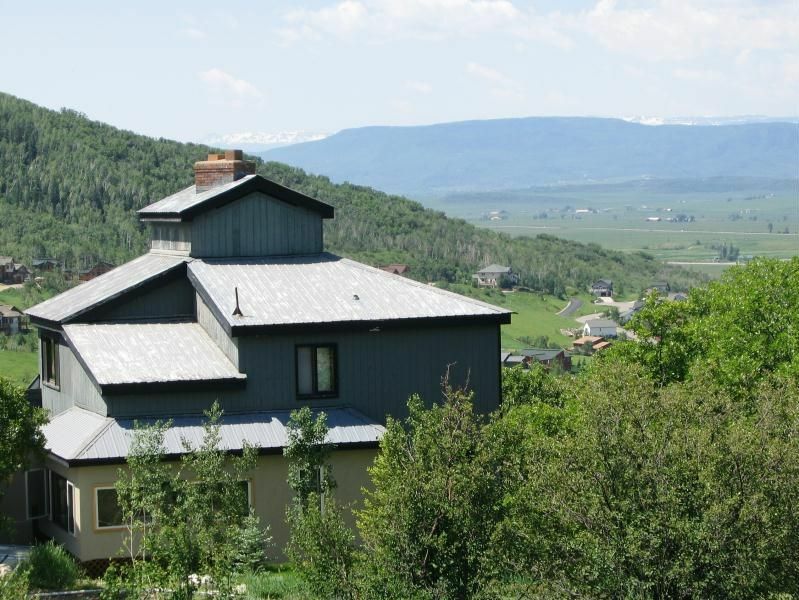 Located high on the mountain in Steamboat's Ski Village, the Royal Flush House has wonderful southern views of the Yampa Valley and the Flat Tops Wilderness Area that extend for miles. This mountain vacation home is a 3,500 square foot, 3 level ski lodge and for over 20 years has established itself as one of the best properties to host a large group, family reunion, multifamily gathering or company retreat in Steamboat. The large fireplaces provide a cozy ambiance and a game room provides endless entertainment for everyone. Street Level Parking and Main Floor Entrance: No steep driveway or steps! Deep parking lot that is ideal for snowmobile trailers. Visit us at Steamboat Springs Chamber of Commerce, member since 2000. Steamboat Springs, Colorado. Vacation Home Rental #VHR-07-17. Parking and entry to the Royal Flush House are street level, no steep climbs to get to the house. All five bathrooms have been updated nicely. Located on Mount Werner, high up in Steamboat Springs' Ski Village with beautiful views of the Yampa Valley and Flat Tops Wilderness area. BEAUTIFUL southern views of the Yampa Valley for many miles to the Flat Tops Wilderness Area. In the opposite direction you look up to Steamboat's ski mountain, the top of the gondola station and ski runs. Additional tables and chairs are available for dining or buffets. Private hot tub with beautiful ski mountain and valley views. Family owned and property managed. Steamboat Springs Chamber of Commerce member since 2000. Other Activities: Enjoy the VISTAS and relax, relax, relax!